The Dendritics Millicarat 50 is the first and only portable carat scale to weigh 50.000 carats by an amazing .001 carat precision. This is the ideal portable scale for diamond weighing. Millicarat 50 is the same convenient size, 5" X 3" X 1, as the other famous Dendritics Gemscales, but Millicarat 50 is faster, has a low battery icon and a new stability indicator. 300 operating hours on one alkaline 9V battery, included. One button Operation. Easy to use. Totally compact and self-contained. Saves you valuable counter space. TWO year warranty. Made in the USA. 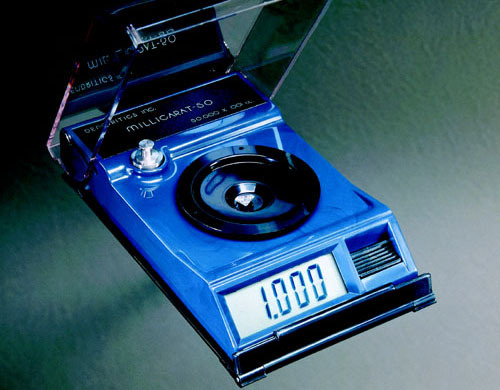 The world's first portable scale for diamonds is Millicarat -50. The new, high resolution of .001 carats to 50 carats is a standard previously found only in more expensive and larger balances. Millicarat -50 is 5"x3"x1" and runs on a 9V Alkaline battery. The technological breakthroughs and new features such as a low battery indicator, 30 minute turn off and innovative high stability make Millicarat-50 ideal for weighing diamonds in retail, trade show and travel environments.